ITU Triathlon Development arrived in the beautiful island of Trinidad & Tobago during the month of July through the efforts of ITU, Olympic Solidarity (OS) and the Trinidad & Tobago Triathlon Federation to provide yet another emerging National Federation the resources necessary to grow the sport. 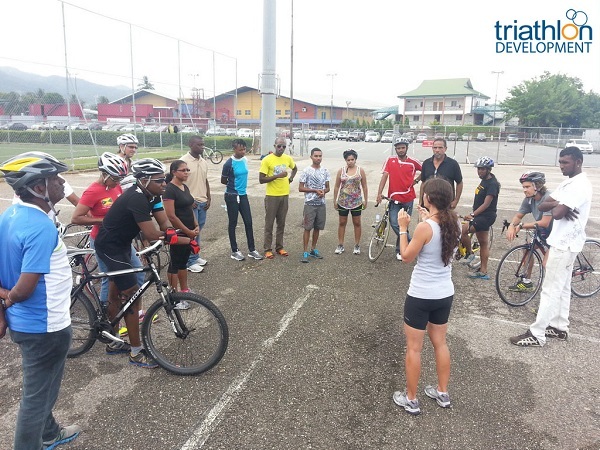 Granted by OS, the project in Trinidad and Tobago, which is also part of the sport development projects for the Americas, aimed at providing local sports and triathlon coaches specific triathlon knowledge and skills that will work as a reference for local projects with the goal of developing triathlon in the country through schools and clubs. The very enthusiastic group of 18 coaches, from different sporting backgrounds and triathlon experiences, attended the intense and rewarding four-day course. The seminar was punctuated by their very passionate interaction, which was noticed in all theory sessions and feedback sessions. The dynamics of the ITU coaches course mixed theory and practice sessions tailored to provide the best overall learning experience for prospecting triathlon coaches. In order to achieve such results, the course was held at the Centre of Excellence Sporting Complex located at Macoya, where all the facilities needed for staging the course were nearby. The course was presented by ITU facilitator Rodrigo Milazzo was very pleased with the course attendance and looks forward to seeing the positive outcome from the course. OS and ITU will bring continuing Sport Development activities in the Americas to benefit other continental emerging National Federations. “The courses fit nicely in our strategic plan for capacity building. With these courses the capability to execute events successfully are within our grasp. The coach course creates the springboard for grass roots development in our villages, towns and communities. The clubs are now empowered to execute triathlon in schools at primary and secondary levels,” said Trinidad & Tobago Triathlon Federation President Stanley Patino. He continued by outlining operational goals moving foward, which include starting the triathlon in schools project and to conclude a feasibility study of hosting a CAC Continental Cup in 2014.